The Apple U-pick will open for the 2019 season around Sept 1-late October. We look forward to another great year. Check back with us in late summer for updates. Call 269-422-1972 for information. Be sure to look for signs for the new entrance at 9800 Hartline Rd., just south of Shawnee Rd. 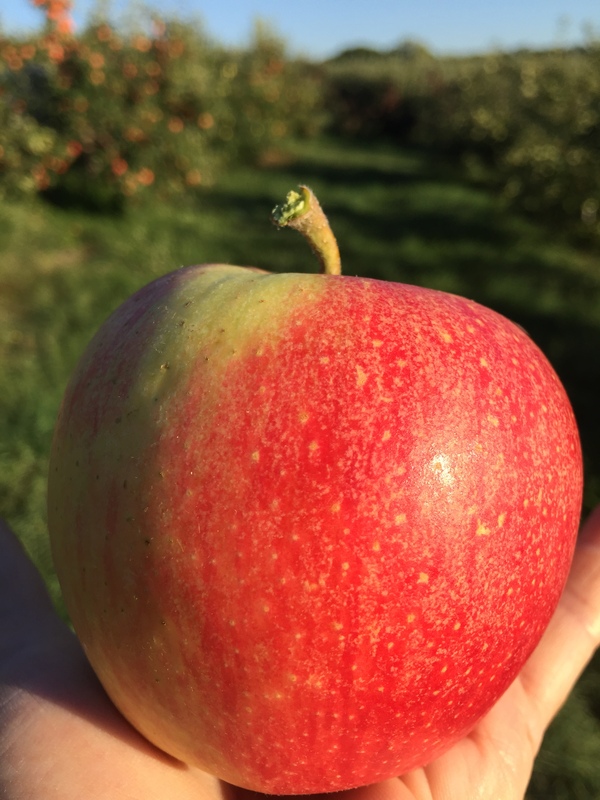 Molly’s Delicious – Ripens with Golden Supreme, an early Red Delicious. Flesh turns soft quickly. Flavor is “bubble gum” sweet. Eat it fresh and in salads. Golden Supreme – Ripens about Labor Day. An excellent crisp sweet apple. Great out of hand and in salads, slices keep their shape when cooked. 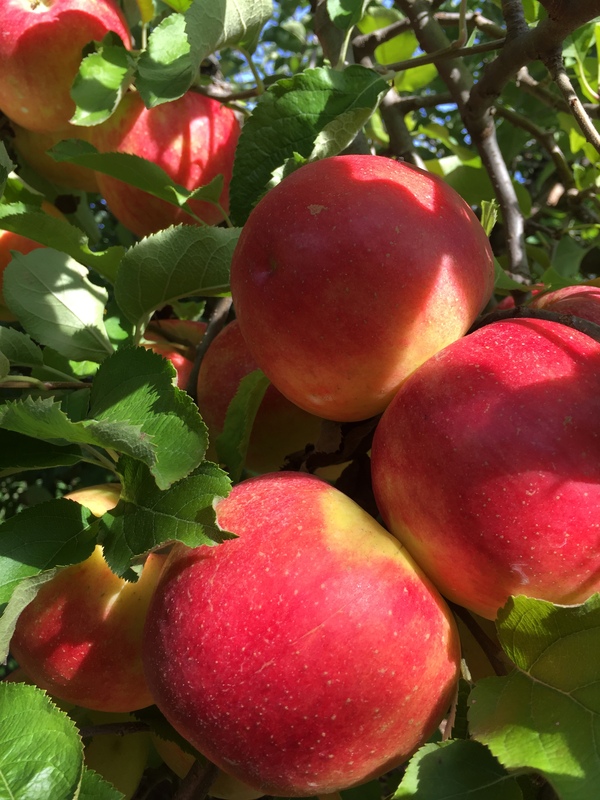 Gala – Ripens about September 10th crisp and sweet a wonderful flavorful red, pinkish apple. Great for desserts and fresh eating. Slices keep their shape when cooked. 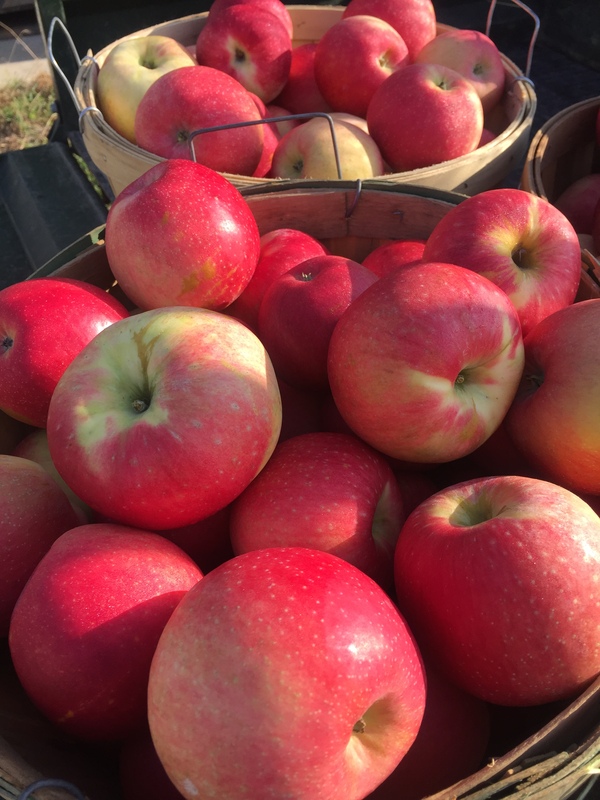 Honey Crisp – Ripens with Gala, a very popular flavorful apple with a texture to match its name. Used primarily for fresh eating and salads, Honey Crisp is also wonderful for baking. Keeps well in storage. U-Pick Not Available. McIntosh – Ripens about September 15th, Sweet-Tart flavor. Of medium flesh, keeps well in storage. Great for pies, canning, sauces, and taffy apples. Flesh becomes soft when over ripe. Jonathan – Ripening about September 20th, an old standard processing, baking, and saucing variety. Is a small tart apple loved for its sparkling flavor, solid flesh and versatility. Keep well in storage. Golden Delicious – Ripening about September 20th, Golden Delicious is the heavy hitter in the apple world. Its versatility is unmatched. Eat it fresh, slice into salads, bake it into pies, fry it, sauce it, Freeze it, can it. Golden Delicious does it all! Known to keep up to 6 months in storage. Red Delicious – Ripens the end of September, A large sweet apple. Great for fresh eating and in desserts. Stores well, but can become mealy if left too long. Jonagold – Ripens about September 20th, A cross between Jonathan and Golden Delicious with the best qualities of both, as versatile as its predecessors. Flavor has more spark than Golden Delicious, but not as tart as Jonathan. Try these and you will have found a new favorite. Large attractive apple with solid flesh. Empire – Ripens about September 20th a solid fleshed round, sweet, red apple that when left on the tree, will become dark purplish red. Turns soft when overripe. Best for salads and eating out of hand. Bella – Medium Sized sweet apple with subtle fruity undertones. Flesh is medium. Eat fresh out of hand or in your favorite salads. Great in applesauce and pies. Sonata – A medium sized apple with very solid flesh, intense sweet, tart flavor. Yellow background color with large red blush. Snow Sweet – Ripens about September 30th a solid very white, sweet flesh. Flesh stays white for a long period after cutting. Great For Salads and eating out of hand. Cameo – Very robust Flavor with mix of sweet and tart. Flesh is very dense. Great in sauces and pies. Ida Red – Ripens about October 1st, a solid fleshed, thin skinned, Large glossy apple. Flavor is tart and is great for pies and apple sauce. A super keeper! Mutsu – Ripens about October 1st, Mutsu is gaining in popularity. A very large green/yellow Golden Delicious- type apple. Very versatile. We call it the four apple pie apple. Fuji – Ripens about September 20th. A sweet crispy favorite for eating fresh out of hand and salads. Rome – Ripens about October 1st, a red, solid fleshed apple. Romes have a unique flavor, not tart, but not too sweet. Great for pies, sauces, canning and freezing.